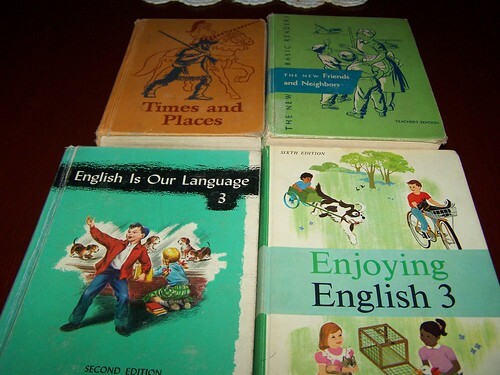 I love old books, especially old school books.� I thought I would share a few of them.�� I thought I might share how our school days “normally” go.� I usually wake the girls around 7:00 A.M.� They get dressed, make their beds and come downstairs by 7:30.� Sometimes they fix their own breakfast and sometimes I do.� It mostly depends on what they are having and how our time is running.�� I begin cleaning up the kitchen and they start piano practice.� They practice 30 min. each.� While one is practicing the other one is helping me and then vice versa.� We shake the rugs and sweep the floors every morning.� We have certain days that we do other things, clean bathroom, dust.� I have a chart made with the days of the week on it and the designated chores for that day.� We try to have all the house chores finished before we start school.� It is so difficult for me to concentrate on school if these things are not already done.� Laundry gets worked in� every day.� We are normally finished with all this around 9:15.� They then get a 15 min. break to do whatever they want.� We try to start school by 9:30.� We say our pledges, pray and then begin.� Bible is always first.� Then they take turns chosing what subject they want to do.� Our subjects are bible, spelling, history, science, math and language.� Most days we are half way through by lunch time.� We break an hour for lunch.� Free time for everyone (except Mom).� We then finish up somewhere between 1:00 and whenever.� Yesterday was a long day for us.� It was about 3:30 when we finished.� Julie’s math was very long.� Today is an easier day.� It is now lunch time and all we lack is math.� I’m glad as we need to work up an 1/2 bushel of apples.� I already have them in the steam juicer and I want to make applesauce from them.��Well, our lunch break is almost over. � I hope I didn’t bore you all too much.� Enjoy your day and God bless. Your daily school schedule sounds wonderful! We do breakfast/prayer time before we start school. We start school with spelling, move on to math and language, have lunch, then finish up with science, health, and history. Now it is time for outdoor chores/outdoor play. We come in and prepare/have supper. Around 9 or 10 pm we pick up, empty dishwasher, and clean house so we are ready to go in the morning. :)We read/discuss the Bible/ have devotions as a family right before bed. Quentin’s day off is a whole other story! I love your old books. 🙂 We need to try to go the book sale at the thrift store in Radford together. We have bought a lot of old books there and they are saving up books just for the book sale. I think it is the second week in October. I feel the same way about the house. I feel so much better if it is in decent order before *school* offically starts. You surely didn’t bore me at all!! I LOVED hearing about your routine (and Vicki’s from her comment). I love old school books too ( and old story books and old cook books..lol). I have several old school books. I like to just sit and look at the pictures in them 🙂 Did you pretty much have this same routine when your children where in the early grades? Good Evening, Donna.. You never bore me.. I always love to see that you have posted.. Maybe, I am just nosy but I like to see how others live and learning new stuff all the time..
AND making such dear friends along the way.. I always like reading about other people’s schedule. I agree with you, it’s hard to focus when chores need to be done. I need to dust today. Have a great day. I love the old books like that. Some days we have very long math lessons. I am sure it is a nice routine that you have. My girls do their subjects, usually in the same order every day. I liked hearing about your day! I can’t do anything untill the house is tidy. (Well, lately it has been getting things tidy in the camper!) Matter of fact, laundry is the very first thing I do after all the beds and kitchen is done!